Like everyone who likes to play with paper, scissors, and glue, I have a ridiculous stockpile of paper scraps. 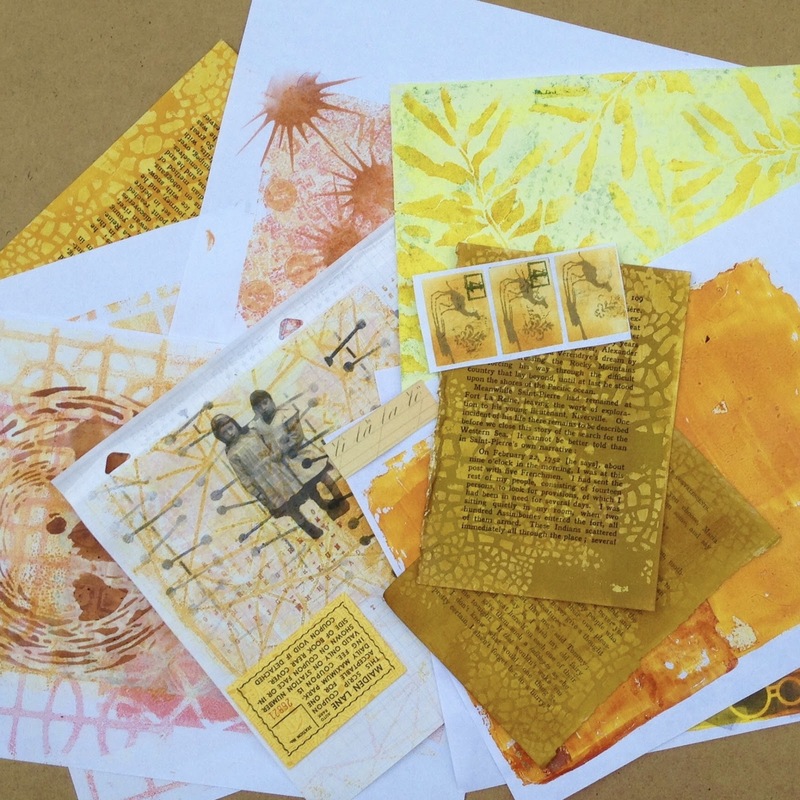 I spend lots of time experimenting with different media on different types of paper. You too, right? How often do you end up with a stack of papers, most of which may not be very useful but which have sections you really like? And how often do you sort through those stacks of paper, speaking very sternly to yourself about tossing anything that's not really very good and usable? If you're like me, hardly ever. 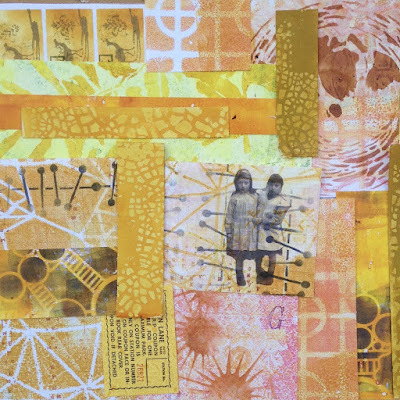 I hate to throw away anything pretty, and stopping the fun to do tedious clerical sorting and filing isn't my idea of the best thing to do at any given moment in my studio. But seriously, every once in a while I HAVE TO CLEAN my studio. If you are generous with the definition of "stored in my studio" you could say that slithering heaps of paper on every flat surface count as "stored," but really, I have reached a point where I have no more working surface. It's all storage. That means it's time to separate the wheat from the chaff. One thing that I do along the way to this mess that works in my favor is that I tend to experiment with one color or color group at a time, and as a result, I may end up with stacks that are grouped by color. If I have a stack of gel prints of mostly one color, or pages I was trying out a new stencil or stamp on with a particular inkpad or paint tube, I can then go to my real storage (organized by color, more on this later) and find assorted ephemera or scraps of other work, and create a stack of more or less harmonious papers. This is exactly that kind of stack. The next thing to do is take a hard look at each piece of paper. Is the entire piece of paper a masterpiece that must remain in my life forever? No. No. A thousand times no. So out comes the trusty paper trimmer to reduce this unruly stack into manageable pieces of just NICE BITS. And then here comes the hardest part: if what's left is Not Nice, you must throw it away. Trust me on this. You will never actually run out of paper, so you can take the risk and throw out the less than really nice pieces, the ugly color, the messy blob that got under the stencil, the gel print that didn't turn out at all like you imagined it would after the video you watched on YouTube. Bring a little Marie Kondo (Life-Changing Magic of Tidying Up) to your paper stash and ask does this "spark joy?" If not, toss it. Now I have a smaller pile. Ideally these are all Nice Bits. Maybe my opinion of what counts as a Nice Bit changes from one day to the next. Today, I have this pile of nice bits, and it's time to put them together. You may have heard of "Frankenpaper." That's essentially what this is. You are making new paper out of parts of other papers. The risk is that you end up with something stiff and clumsy and hard to control, and you do not want the villagers coming to your castle with torches and pitchforks tonight. The trick is to keep it light and flexible, and not gunk it up. I use deli paper as the substrate, since it's thin but strong, and I use a glue stick to keep the adhesive to a minimum. You could use matte medium, but adding that much acrylic gives you layers of plastic coating, and that may end up being less manageable later on. so I ended up adding black for more contrast. I like how the Antennas look like rows of stitching or haphazardly stapled seams, which I thought was a nice nod to the Frankenstein project. 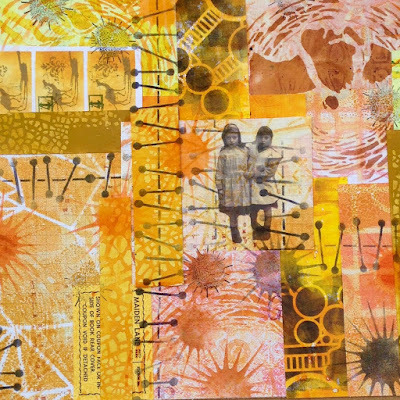 The goal here is to add your new layer of stenciling across the underlying collage, thus unifying the paper. I've now managed to reduce a slithering pile of papers into one new sheet that is all my own. I can use it as is, I can cut it into smaller pieces (making more Nice Bits! ), I can isolate some sections with white gesso in order to feature the vintage photo transfer in the middle - you name it, whatever you might want to do with patterned paper, you can do with this. But wait! There's more! Do you also keep the Little Bits? Sometimes we cannot help ourselves - we just can't throw out those precious darlings. You can use them the same way and make your own patterned paper tape. Get some wide painters tape and tear off a long strip. Put it on your surface sticky side up and start sticking down the Little Bits! 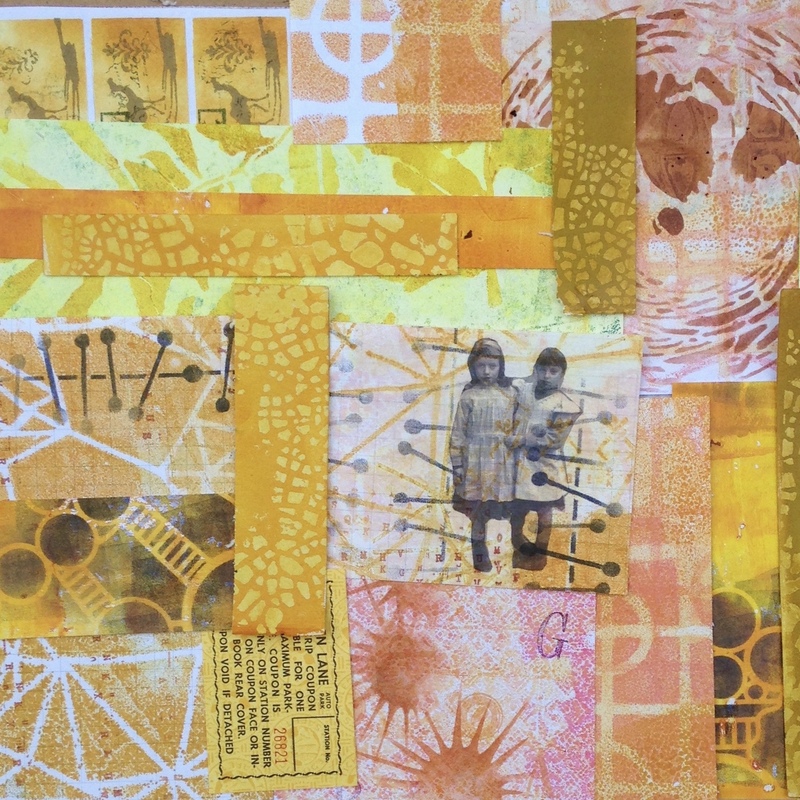 Once you've collaged all the tape with Little Bits, stencil (ideally with small shapes or patterns) across the whole thing and bring cohesiveness to your Frankentape. It no longer has a sticky side, but you know how to handle that. 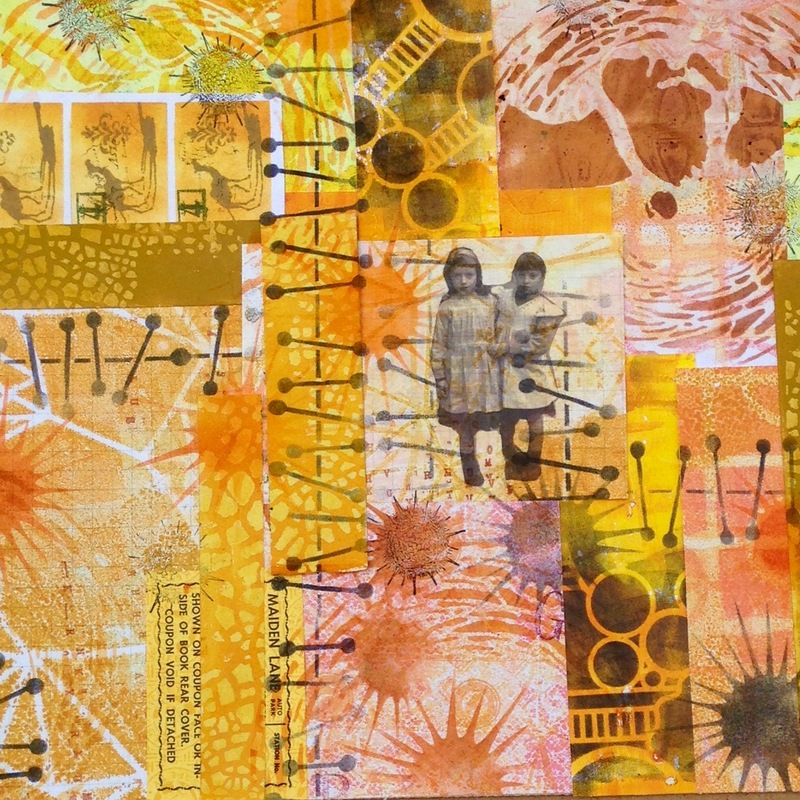 You can use it to add borders, frames, cut thinner strips, you get the idea. I mentioned above that I would say more about my storage system - I follow the organizational principles laid out by Tiffany Spaulding on the Totally Tiffany blog. 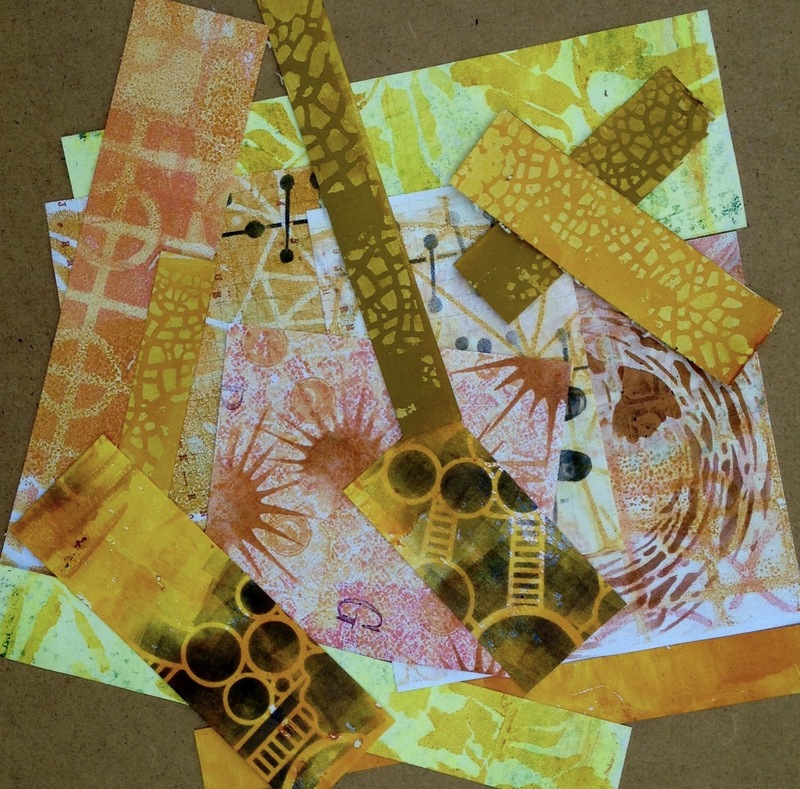 Her basic premise is that we design by theme, not by medium or tool, so if I have botanical-themed stencils, rubber stamps, ephemera, stickers, etc. they should be stored together in one place. 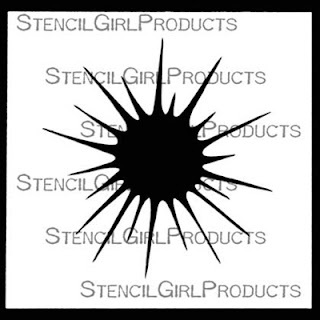 That way, if I want to add a flower or tree to a composition, I can go to that location to find all the ways I have to add that botanical element, instead of going to where my stencils are, then to where my rubber stamps are, then to where my clip art is, etc. After themes (stored alphabetically) come colors, so I can gather all the miscellaneous black and white scraps together, all the reds and pinks and oranges - you get the idea. I also use the ScrapRack system that she designed, so I can flip through all my categories and find what I want to use. I tend to be lazy about putting things away, but periodically I sort everything into their categories and return them to their designated zone. 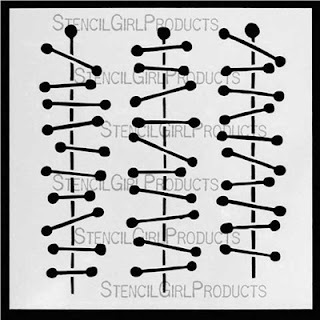 Many of my StencilGirl® stencils are graphic design or pattern, and I lump them into subcategories of circles or round patterns, linear or grid patterns, organic or abstract patterns. 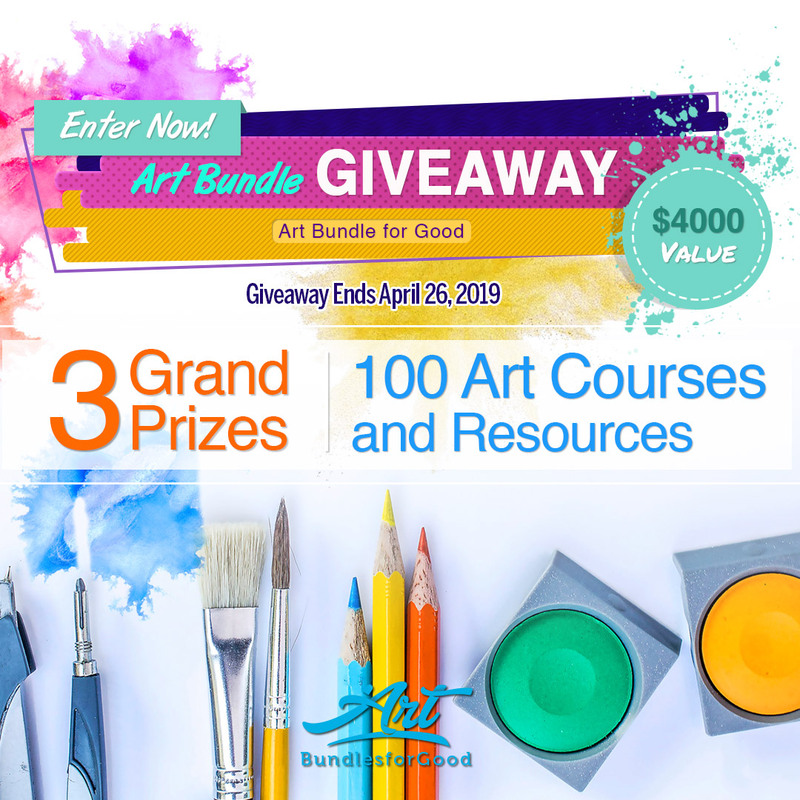 My thematic categories are letters and numbers, animals, architecture and landscape, botanicals, graphic design (with the above subcategories), mail and postal, maps/charts/diagrams, people/figures, photos (vintage), text/words, then Halloween, Christmas, and then color groups. I find that this system works well for someone with a large mixed media collection - your categories depend on what you have lots of. You may need a whole category just for dogs, or you might really dig Valentine's Day and have a section just for hearts and related sentiments. 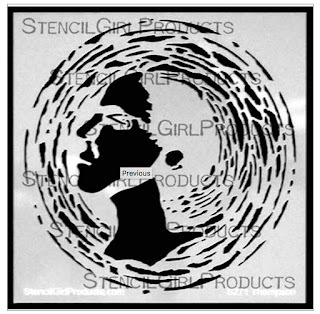 You may have your own preferred way of describing the most prominent characteristic of a stencil - for example, if you consider the most prominent feature of the Angel Circle stencil to be the angel, maybe you keep it in a section of people/figures, but if you think of it primarily as a circular design element, you might find it more useful to store it with other circles. And now, it's time to go tidy up the studio. If all goes well, I will have fewer piles of messy paper, and a few more sheets with only Nice Bits!